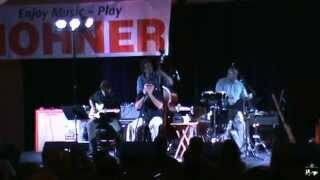 PT Gazell at the Society for the Preservation and Advancement of the Harmonica in 2014 in St. Louis accompanied by Pat Bergeson on guitar, Tom Good, bass, and percussionist Jeff Boggs. 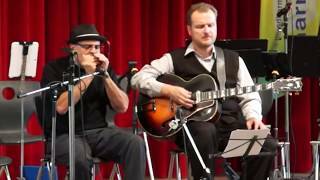 PT Gazell and Marek Rejhon perform "If I Had You" in Klingenthal, Germany at the Mundharmonika Live Festival in 2015. PT Gazell has earned his position as a master of the diatonic harmonica by taking the long road from Oconomowoc, Wisconsin, to Nashville, Tennessee. First picking up the instrument in his late teens, the self-taught player honed his craft by taking on all manner of musical styles and traveling a circuit that included bluegrass, folk, and pop festivals and gigs. He will be joined this evening by Andy Reiss on guitar and Geoff Henderson on bass. With five solo CDs now under his belt, including the double-Grammy-nominated 2011 release 2 Days Out, and the triple-Grammy-nominated 2016 release A Madness To The Method, PT Gazell continues to expand the musical boundaries for the harmonica using his own signature model instrument, the Gazell Method diatonic manufactured by C.A. Seydel Sohne. No other player combines his phrasing, his melodic style, his song choices and his improvisational abilities. His singular style may draw comparisons to others, but in the end, it’s a style all his own.